Most of my posts the last few months have focused upon the altruistic dimensions of providing healthcare – high-quality outcomes, empathetic service and the process-engineering that continuously improves that care. I’ve also written about the crisis in paying for America’s healthcare; private and public payors demand we use less money to achieve better outcomes. This week I’ll write about the search for The Holy Grail that connects the two … how integrated delivery systems (IDSs) such as ours lower the cost of a unit of care, while simultaneously improving patient outcomes. Historically, IDSs have gotten away with having higher costs for a patient office visit by having lower hospital and pharmacy costs for that same patient. Indeed, our “relative expense” from the former is more than offset by the “relative savings” of the latter, thus enabling us to charge a total price that is lower than non-integrated (traditional) care. That math works only as long as the patient (or her employer) pre-pays for total care (office visits + hospital + pharmacy). But what if the highly touted “Consumerism Movement” in US healthcare (individual patients making individual buying decisions for individual units of care), coupled with “Pricing Transparency” (every price for every unit of care from every provider in the neighborhood available on the patient’s smartphone, right now) led patients to truly shop for a unit of care (say, an annual GYN exam or diagnostic colonoscopy or laparoscopic cholecystectomy) among a number of IDS providers in the city? In the new healthcare market, if our price for a unit of care is higher, the patient must believe ahead of time we are worth the additional cost, or she’ll spend her Healthcare Savings Account (HAS) dollars elsewhere. If our price is market competitive and our service or outcome superior, more deductible HMO (dHMO) and high-deductible healthplan (HDHP) members will choose to receive their care from us, rather than the IDS down the road. 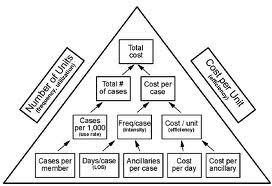 In the next three posts, I’ll propose a “what” and a “how” of reducing our unit costs (prices for an individual unit of care), followed by some business principles that must be reconciled in order to succeed. This entry was posted in "Think Like an Owner", Health Care Costs by Rob Schreiner. Bookmark the permalink.